Frank Lloyd Wright’s Larkin Building has become an icon of modern architecture. And the fact that it was demolished only forty-six years after its 1904 completion makes Jack Quinan’s study of the building—which housed a Buffalo, New York, soap company—all the more valuable. Quinan’s history draws on engineering documents, personal accounts of the building, and other papers he acquired from the family of Darwin D. Martin, a Larkin executive who proposed commissioning Wright to design the company’s offices. With access to these rare sources, Quinan reveals how a young Wright landed the commission and traces the evolution of his cutting-edge plans. 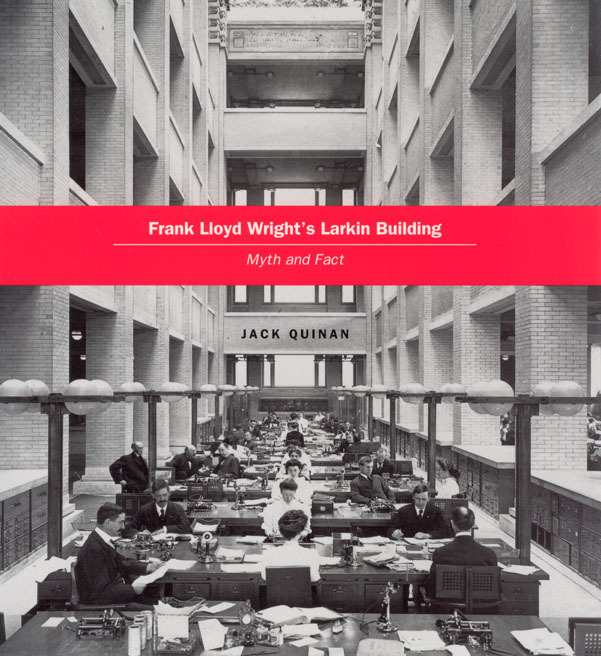 Quinan then takes Wright studies to a new level, examining the Larkin Building as a structure at the center of economic and personal relationships. Illustrated with more than one hundred photographs, floor plans, maps, and diagrams, Frank Lloyd Wright’s Larkin Building provides a concise but complete record of how the building was conceived, built, evaluated, and finally demolished in what has been called a tragic loss for American architecture. Foreword by Edgar Kaufmann, Jr. Appendix E: "The Inscriptions on the Court of the Administration Building"
Appendix G: Frank Lloyd Wright, "The New Larkin Administration Building"
Appendix H: William Heath, "The Office Building and What It Will Bring to the Office Force"
Appendix I: George Twitmyer, "A Model Administration Building"
Appendix J: Marion Harland, "The Administration Building"
Appendix K: Russell Sturgis, "The Larking Building in Buffalo"
Appendix L: Frank Lloyd Wright, "Reply to Mr. Sturgis’s Criticism"